Stay afloat with Speedo and the Printed Neoprene Swim Vest. American Red Cross Licensed for water safety. Swim Level 2: Water Confidence - These products provide the tools to build confidence for a child already familiar with the water and learning to swim. UPF +50 protection. Adjusts safely between the legs. Neoprene shell with custom print. Heavy duty front zipper. 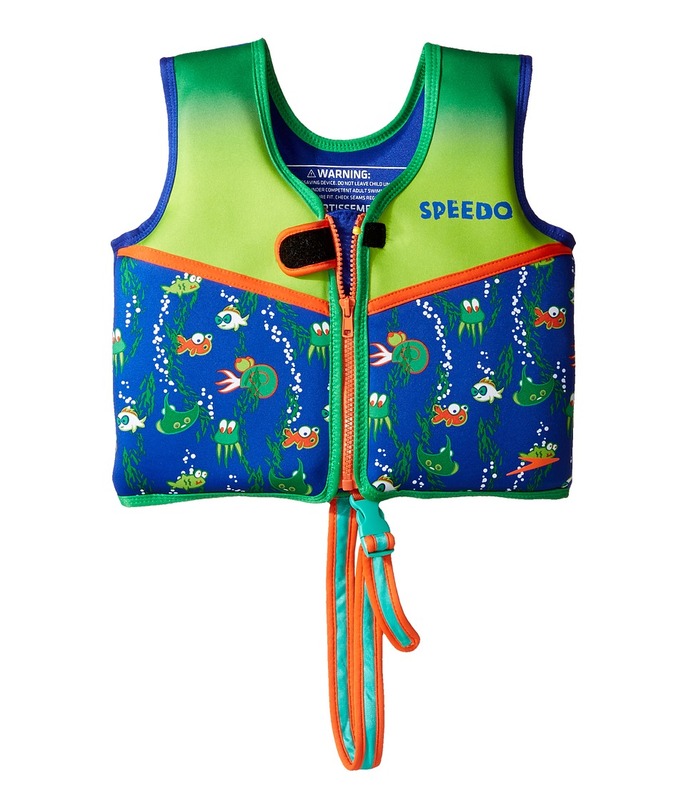 Sizing: MD: Ages 2-4 Years Weight Capacity: 33-45 lbs. LG: Ages 4-6 Years Weight Capacity: 45-60 lbs. Imported. 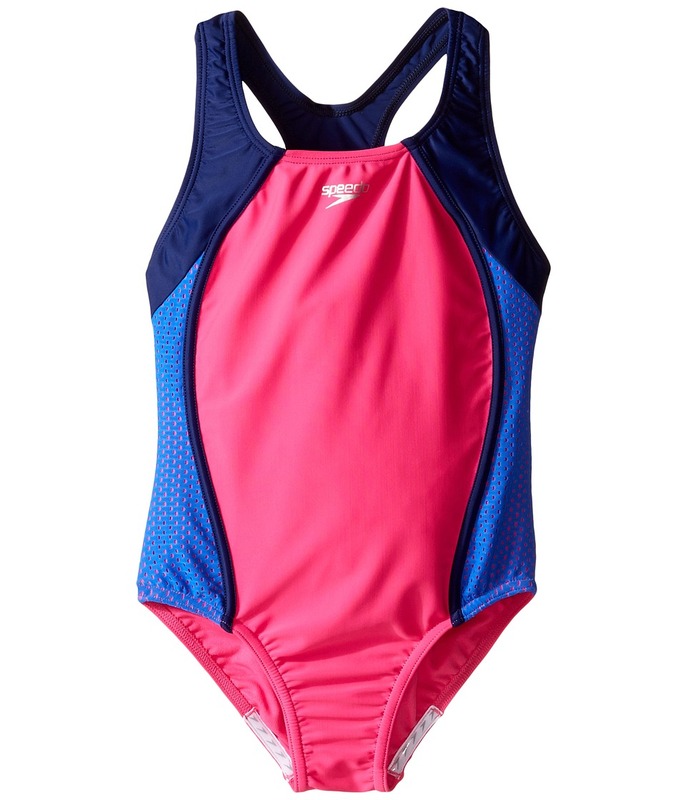 Swim ahead of the competition with the Infinity Splice One-Piece Swimsuit. Recordbreaker back features a lower back and higher cut for ultimate freedom of motion. Xtra Life Lycra Fiber: &amp#8226 Lightweight stretch fabric offers a wider range of motion in and out of the water. &amp#8226 Engineered to last over 200 hours in the pool. &amp#8226 Resists sagging, suntan lotion, oils, and chlorine. Scoop neckline. Racerback with wide-cutout detail for enhanced mobility. 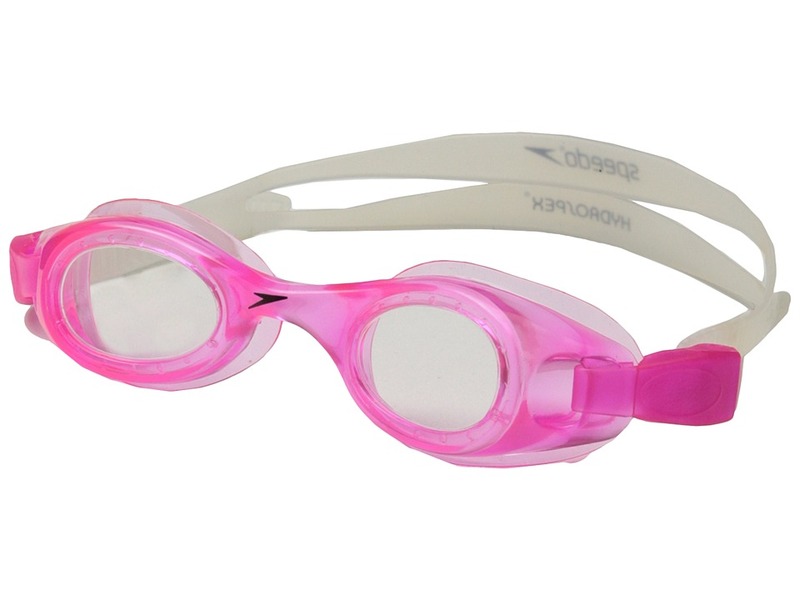 No-Wedge Worries offers a silicone-gripper edge that keeps your suit comfortably in place. Moderate-rear coverage. 82 percent polyester, 18 percent spandex. Hand wash, line dry. Imported. Measurements: One Piece Length: 16 in Product measurements were taken using size 4 Little Kids. Please note that measurements may vary by size. If you~re not fully satisfied with your purchase, you are welcome to return any unworn and unwashed items with tags intact and original packaging included. 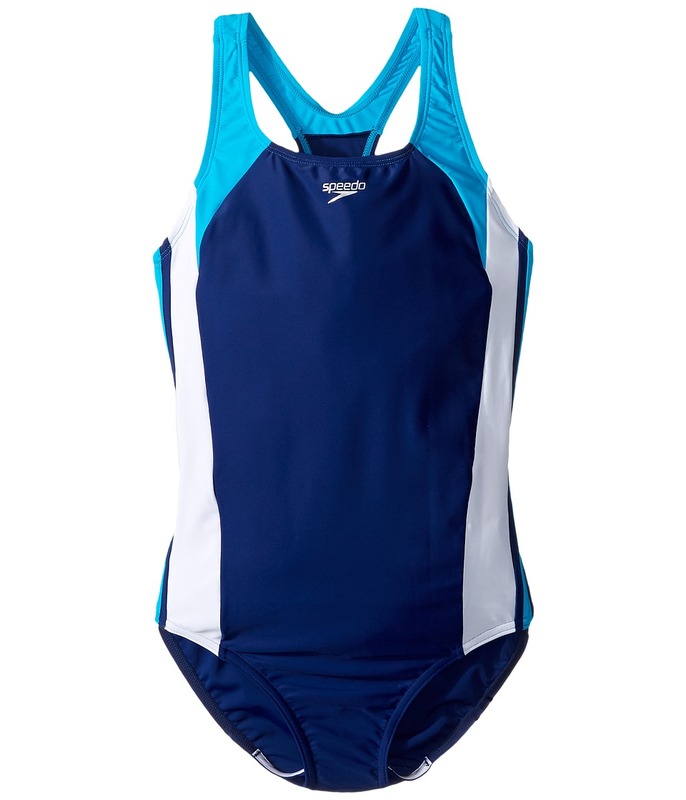 Swim laps around the competition in the Infinity Splice One-Piece Swimsuit. Xtra Life Lycra Fiber: &amp#8226 Lightweight stretch fabric offers a wider range of motion in and out of the water. 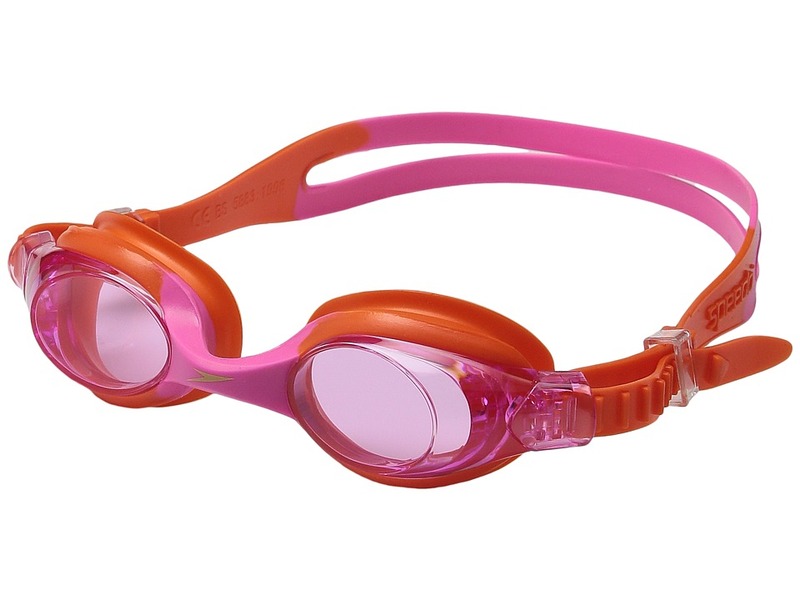 &amp#8226 Engineered to last over 200 hours in the pool. &amp#8226 Resists sagging, suntan lotion, oils, and chlorine. UV50+ Block the Burn protection from the sun~s harmful UVA and UVB rays. Scoop neckline. Racerback design with cutout detail. No-Wedgie Worries offers silicone gripper at back legs for stay-put comfort. Moderate-rear coverage. 82 percent polyester, 18 percent spandex Lining: 100 percent polyester. Hand wash, line dry. Imported. Measurements: One Piece Length: 19 in Product measurements were taken using size 8 Big Kids. Please note that measurements may vary by size. If you~re not fully satisfied with your purchase, you are welcome to return any unworn and unwashed items with tags intact and original packaging included. 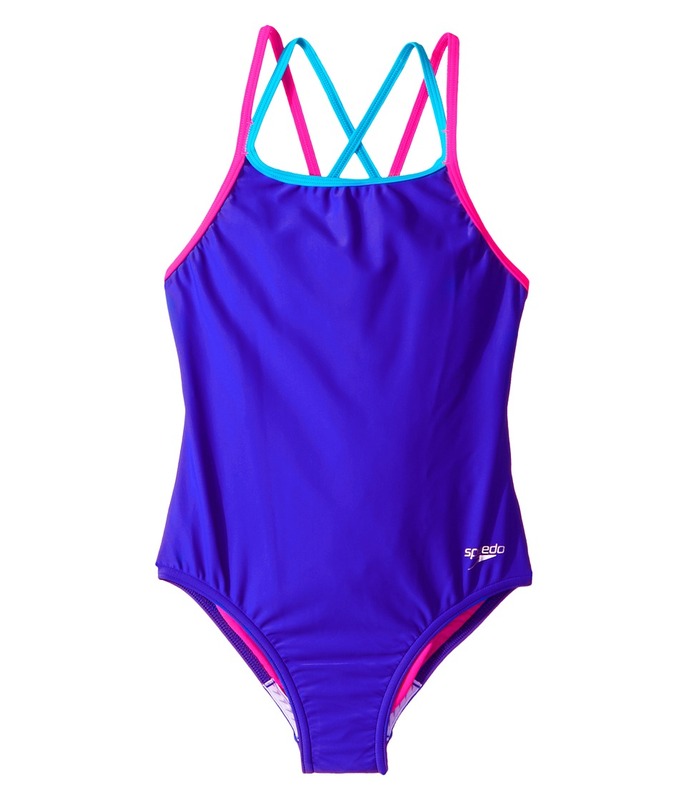 Training or splashing around, the Mesh Splice One-Piece Swimsuit was built for it all! Durable stretch blend offers increased mobility and superior chlorine resistance for longer wear. UV50+ Block the Burn protection from the sun~s harmful UVA and UVB rays. Scoop neckline. Mesh insets at sides for enhanced breathability. Racerback design with keyhole cutout. No-Wedgie Worries offers silicone gripper at back legs for stay-put comfort. Moderate rear coverage. 82 percent polyester, 18 percent spandex Lining: 100 percent polyester. Hand wash, line dry. Imported. Measurements: One Piece Length: 19 in Product measurements were taken using size 8 Big Kids. Please note that measurements may vary by size. If you~re not fully satisfied with your purchase, you are welcome to return any unworn and unwashed items with tags intact and original packaging included. 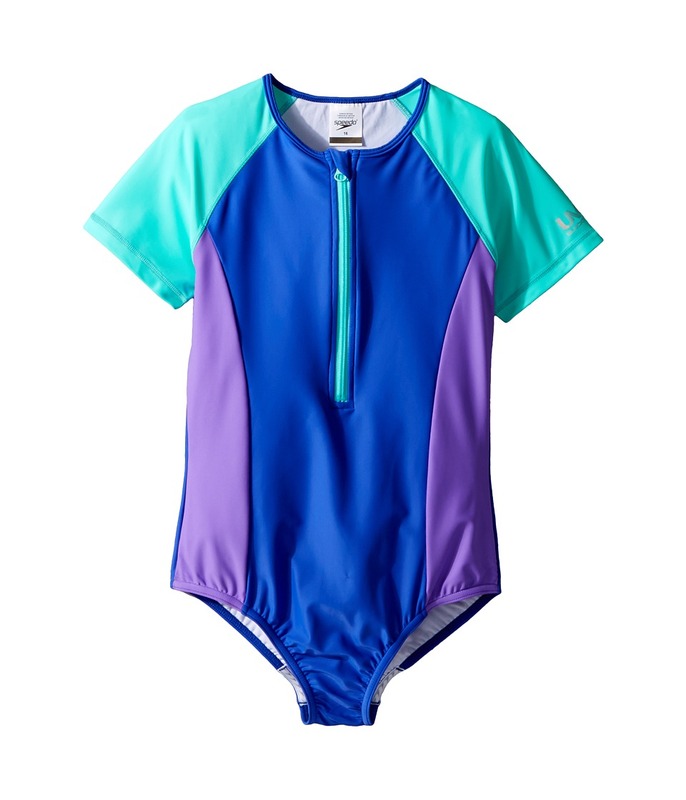 Hit the water with stylish waves in this high-performance one-piece swimsuit. Durable creora highclo spandex offers superior chlorine resistance for longer wear. UV Block The Burn technology utilizes a tighter knit, improved fit, and increased coverage to deliver UPF 50+ protection. Round neckline. Front-zip closure. Short raglan sleeves. No-Wedgie Worries silicone grippers offers stay-put coverage. 80 percent nylon, 20 percent creora highclo spandex Lining: 100 percent polyester. Hand wash, line dry. Imported. Measurements: One Piece Length: 23 in Product measurements were taken using size 12 Big Kids. Please note that measurements may vary by size. If you~re not fully satisfied with your purchase, you are welcome to return any unworn and unwashed items with tags intact and original packaging included. Swim laps around the competition in the Crossback One-Piece Swimsuit. Durable stretch blend offers increased mobility and superior chlorine resistance for longer wear. UV50+ Block the Burn protection from the sun~s harmful UVA and UVB rays. Round neckline. Thin, fixed shoulder straps. No-Wedgie Worries offers silicone gripper at back legs for stay-put comfort. Moderate rear coverage. 80 percent nylon, 20 percent spandex. Hand wash, line dry. Imported. Measurements: One Piece Length: 22 in Product measurements were taken using size 16 Big Kids. Please note that measurements may vary by size. If you~re not fully satisfied with your purchase, you are welcome to return any unworn and unwashed items with tags intact and original packaging included. 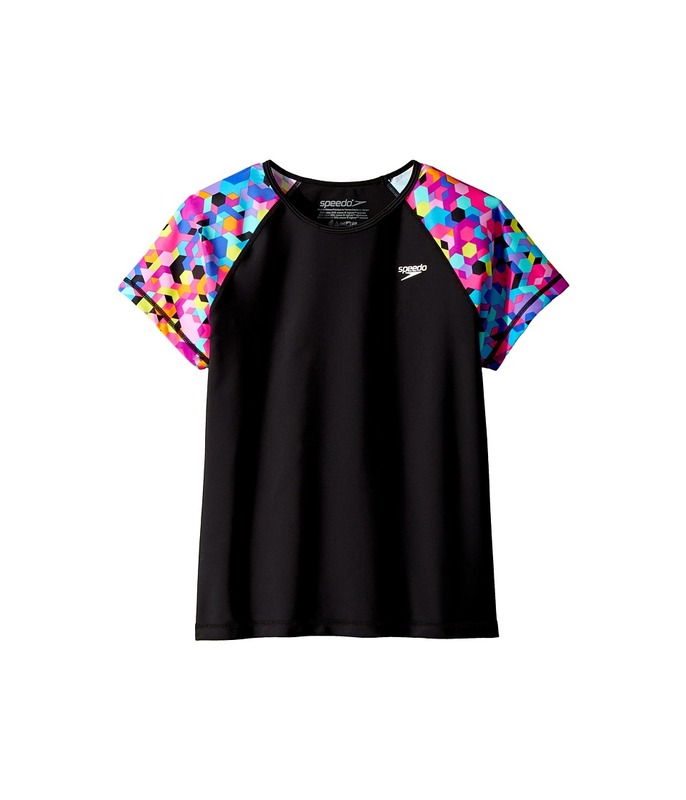 Hit the surf and sand in this versatile Speedo Rashguard. UV50+ Block the Burn protection from the sun~s harmful UVA and UVB rays. Durable stretch fabrication offers all-day comfort and increased mobility. Round neckline. Short raglan sleeves. Brand logo at left chest. Straight hemline. 80 percent nylon, 20 percent spandex. Hand wash, line dry. Imported. Measurements: Length: 18 1 2 in Sleeve Length: 9 in Product measurements were taken using size LG (12 Big Kids). Please note that measurements may vary by size. If you~re not fully satisfied with your purchase, you are welcome to return any unworn and unwashed items with tags intact and original packaging included.